Relaxation Area A Sponsorship Opportunity? Sponsoring the Relaxation area can offer a rare chance to create a memorable moment for sponsors/exhibitors key client’s hottest prospects. Who feels in a better frame of mind after a professional massage? Everybody! 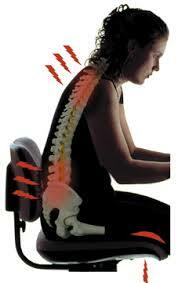 – the time to capture that important business – massage has created a sense of euphoria since the dawn of time! Maximum exposure and repeat messaging through branding! all massage therapists wearing branded t-shirts, handling feedback forms, giving product information, distributing freebies, the list goes on…. potential clients feeling great before you speak to them. 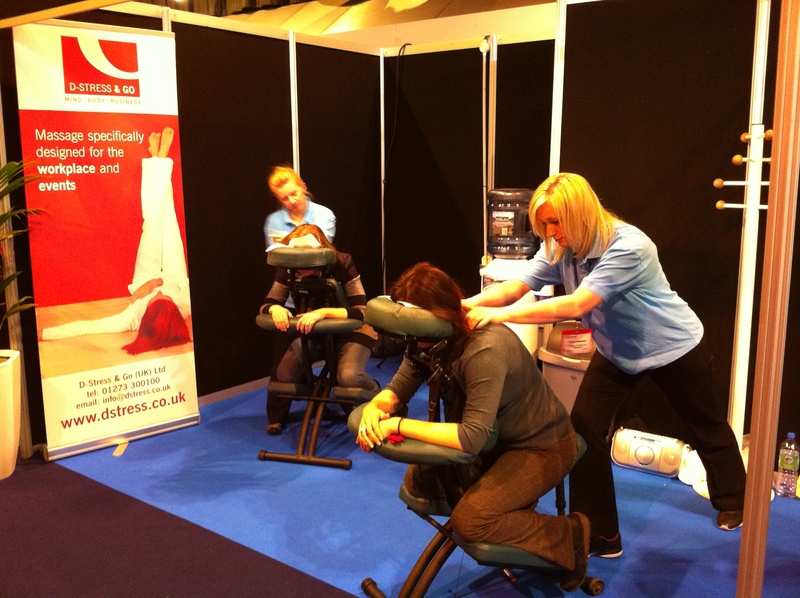 Multi opportunities from experienced relaxation area stand management collecting data on behalf of the sponsor and sending visitors directly to sponsors sales team. A relaxation area is the ultimate focal and resting point for visitors. Highly effective and cost effective in Marketing and Promotion, visitors will associate brand with high quality and assurance. 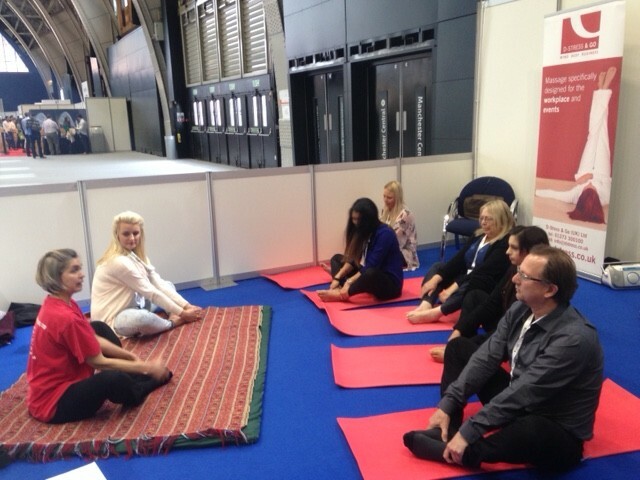 Over a 3 day event A Relaxation Area can generate 1,200 leads! 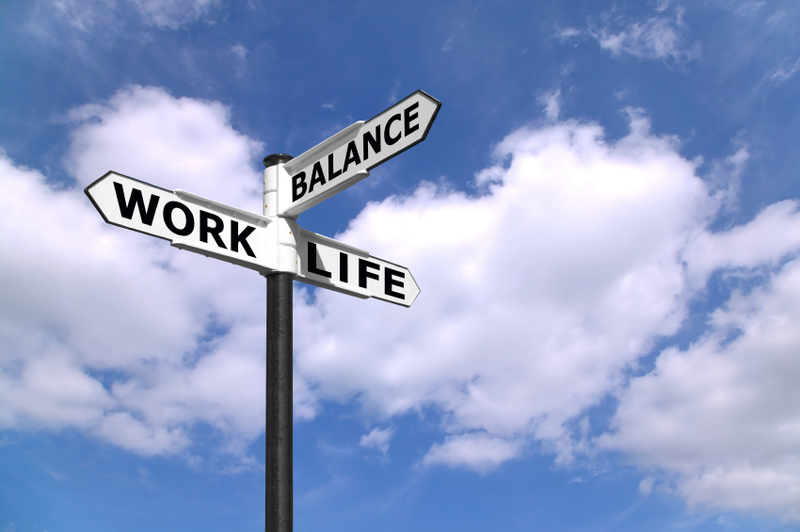 An Inter-Active Sponsorship opportunity with our Relaxation areas across the UK and Europe. We work to produce a bespoke campaign to match the sponsors specific objectives. We create the focal networking point and ultimate visitor attraction you can be guaranteed of your Return of Investment with maximum lead generation, leaflet distribution and VIP’s/delegates/visitors in the best possible frame of mind creating that memorable moment! There are several options to fit any goal or budget and the cost is dependent on the area allocated and how many team members are involved. A unique opportunity to create a memorable moment. What do you get within an Inter-Active Relaxation Area? Indian Head Massage, Seated Acupressure Massage/On-Site Massage, Reflexology Foot Machines, Shiatsu , Reiki,Thai Yoga Massage, Yoga Sessions, Shiatsu Stretch Sessions, Tai Chi Sessions……….. Sponsorship benefits: An Interactive way to increase your exposure and a proven way to grow your business. Guaranteed of your Return Of Investment with maximum lead generation. Looking to launch a new product, achieve brand awareness across the entire industry or highlight a special offer or deal there are several options for this package to fit any goal or budget. Stats prove that over a 3 day event approximately The Relaxation Area can generate 1,200 qualified leads! Opportunities available are:- Collecting Visitor Data – Visitor Feedback Forms – Directing Visitors to Sponsors Stand – Creating VIP Treatment Distributing Literature – Wearing Branded T-Shirts – Distributing Freebies – Trying Products – Verbal Sponsor Promotion Plus the usual branding of the stand….. VIP’s/delegates/visitors in the best possible frame of mind creating that memorable moment! This is one of the most effective high profile positions at the show giving extensive exposure to delegates/visitors with an interest in your field. 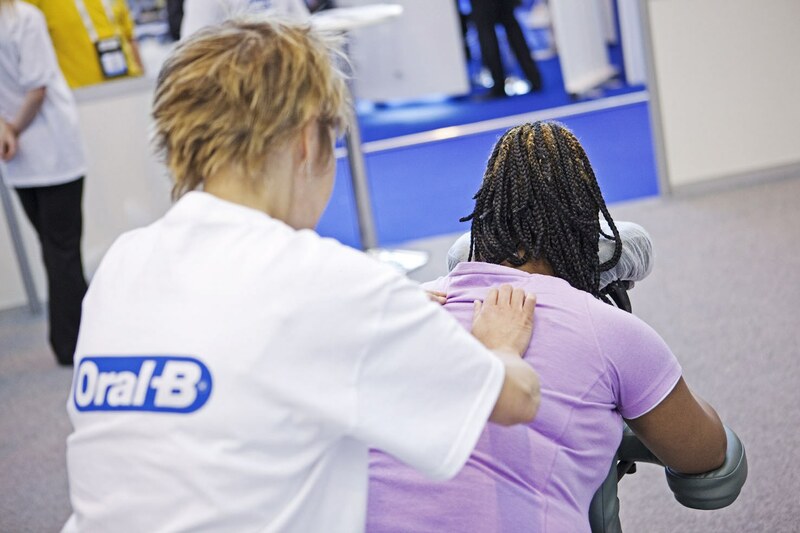 The Relaxation area will have a high footfall of delegates and visitors actively seeking solutions to the day to day issues of their organisation. Reinforce brand recognition in the minds of your key customers, as well as attract new ones Deepen your engagement with the Industries partners Stand out from other suppliers……. It was full on for the 3 day event. Within the first hour of the Relaxation Area opening each day we were fully booked. 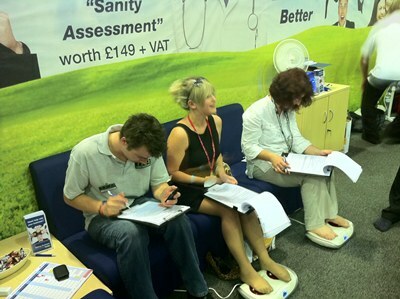 So some visitors did not get a massage but were still able to relax with us on the stand using the Reflexology Foot Machines. We had over 960 visitors on the stand over the 3 days each one with us for a minimum of 30minutes!!! 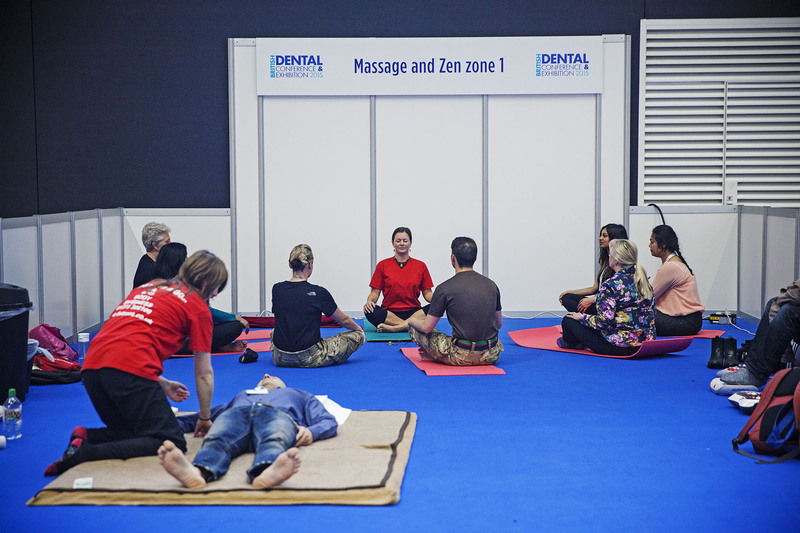 End of April we are running 2 Relaxation Areas at the British Dental Association Conference/Exhibition at Manchester Central. 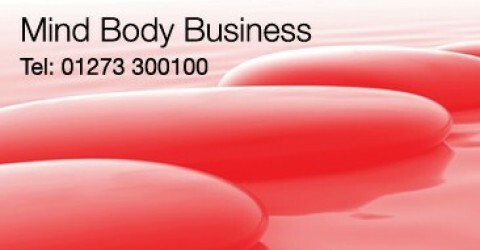 10 therapists = over 2,400 potential clients/direct leads for this years Sponsor……..
We are getting ready here for the Diabetes UK Event at the SECC Glasgow in a week or so. Where the Relaxation Area is being sponsored. 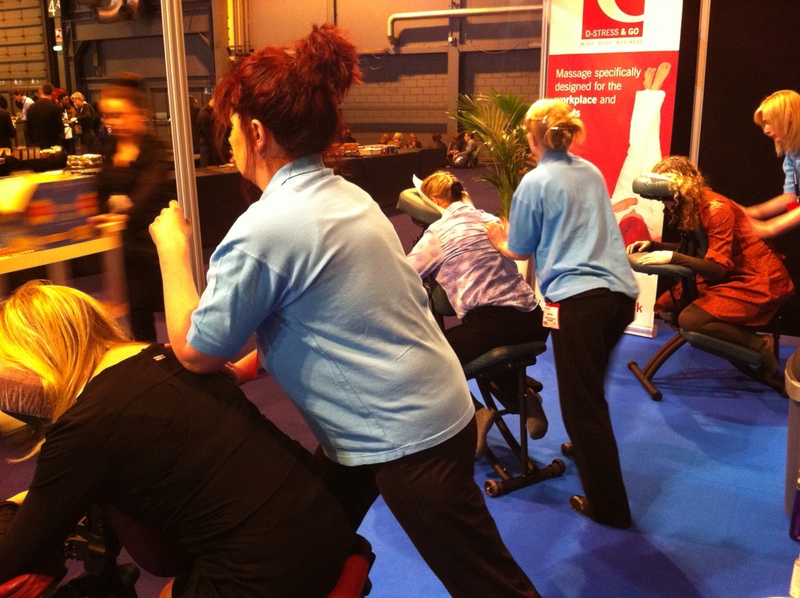 They are using Seated Acupressure Massage, Indian Head Massage and Reiki Therapists plus our Reflexology Foot Machines (very popular) this year! 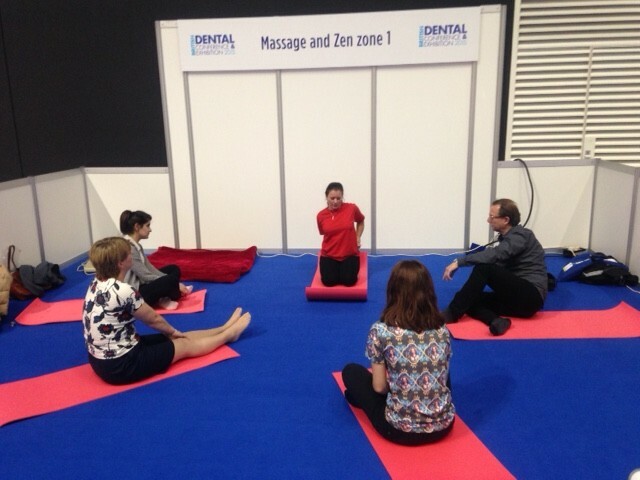 "Collecting Data from Visitors while they Relax"
Plus on that note we have added 2 new therapies to our menu Thai Yoga Massage and Natural Face Lifting both of which are suited to Conference/Exhibition environments. Clothes on and no use of creams or oils. But as we always say its NOT about massage which is just the CARROT, its about an Organiser or Sponsor making the BIGGEST IMPACT at an event.